None of us is promised happiness in this life. All of us are guaranteed sorrow. Indeed, sorrow is the classroom where we often learn our most valuable lessons and through which we can climb ever closer to heaven – where we are promised happiness. Perhaps that’s why I am so drawn to praying the Sorrowful Mysteries of the rosary each week. In those prayers, I am able to meditate on the Passion of Christ and unite my suffering to His suffering. Even though the causes of my sorrow pale in comparison to the agony, persecution and death of the Lord, He has a way of taking mine and making it into something beautiful. Suffering and trial. Pain and patience. Humility and endurance. Fortitude and sadness and faith. No one slides through a life of any significant length without experiencing sorrow and all that accompanies it. Death is inevitable. Sickness and disappointment are inevitable. No matter the size of your bank account or amount of power in your job. No matter the number of friends in your cell phone’s log of contacts or apparent physical shape. Only robots avoid sorrow. Only people with precious few friends and family can know a limit to their occasions to mourn or endure trial – although lonely people such as those know an entirely different brand of deep sorrow. Though blessed with so much good in life, I have known sadness and sorrow. Honestly, I can’t tell you how many funerals I have attended in my 54 years, including close family members and numerous boys and girls (because that’s really what they were) under the age of 21. I have known pain and trials, including more than a decade with clinical depression and severe anxiety. One secret to my endurance and patience: Jesus suffered. The Son of God experienced sadness and pain and trials. As I am writing this, it is a Tuesday evening. About four hours ago, I prayed the rosary and, being Tuesday, that meant my meditation focused on the Sorrowful Mysteries. Therefore, I had the opportunity to unite my suffering with that of Jesus Christ. I can envision Jesus praying in the Garden of Gethsemane. He has had his last meal, shared with close friends. Three of those men recline not so far away from Him. In these moments when danger appears imminent, the Son of Man could use the support and compassion of his most intimate companions. Alas, they sleep. The Lord, also the Son of God, turns to His Father for assurance and perhaps even deliverance from the peril that awaits. The prayer becomes agonizing. Beads of sweat include droplets of blood. His spiritual pain is intense, multiplied by the sins of all humankind in the past, present and future. That includes my sins. 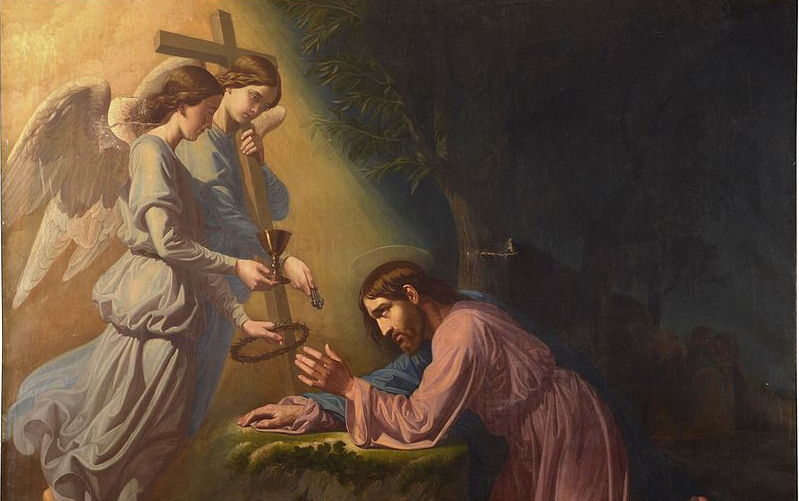 Jesus finds not even one moment of consolation. I have known spiritual pain, thoughts of understanding God’s will but not wanting to go in that direction because of the agony it would bring me. How can I bear it? The pain wracks the body of Jesus. Dozens of lashes with a whip. Beating with fists and clubs. Falling to the ground, the dust and grime of the earth mix with His sweat and blood in open wounds. He screams, unable to hold back his emotions. He moans loudly, unable to willfully summon any external signs of strength against the persecution. He is a man, after all. His flesh is that of a man. His blood is red. The pain is real. I have lived with migraine headaches for more than 35 years, sometimes moved to tears and unable to move my head at all for fear of the throbbing making me scream. I have learned that depression can cause physical pain as well as emotional. How can I bear it? Perhaps more agonizing than any emotional and physical torture, Jesus becomes the object of derision by the Roman soldiers. They “dress” Him like a king. It’s a mockery. The crown, which should feature diamonds and rubies befitting a true King of Kings, features dozens of large thorns that penetrate his scalp. Streams of blood run down his forehead and into his eyes, down his cheeks. I have heard whispers – from others and from voices inside my own head – about how I should be able to overcome my depression simply by having a deeper faith. Society as a whole still doesn’t accept my illness, one shared by millions of Americans, as something serious and debilitating. They might not always mock us to our faces, but behind our backs or when we aren’t around, we hear. We read. We sense. We feel. And in some of those moments, I recall that in my past, I have belittled others, discriminated, mocked. The shame on one hand, the guilt on the other – how can I bear it? Hurting, bleeding, disheartened, weak – and the wood of the cross is so incredibly heavy, even for an able-bodied man in ideal fitness. Yet those soldiers command Jesus to bend over and lift it with his shoulder, then drag it through the uneven, narrow streets of Jerusalem. The man is God, yes, but in these moments He is all man. And the tree He carries has splinters and that great weight. He falls. Falls again. Falls a third time. There is no truly relieving consolation for Jesus on this Via Dolorosa. In fact, He consoles others, those women weeping for Him along the way, His mother. I carry a cross, this chronic illness that won’t relent. Others offer to help carry it, but it’s not really possible with the cross of mental illness. I have to lift it daily, drag it. I fall. I have to get back up. Unlike Jesus, I’m not always able to do that quickly or impressively. My cross is so overwhelming – how can I bear it? Reaching the scene of The Greatest Tragedy In Human History, Jesus is laid outstretched on a tree. Soldiers drive nails through His hands and feet. Looking on this whole time, one wouldn’t think Jesus could experience any greater pain than He had for the previous few hours. But this is a new pain that shoots throughout His entire body with each blow of the hammer. Each blow, I know, is directly my responsibility, the effects caused by my sins. Lifting Him up for all the world to see, both now and forever, the soldiers continue to laugh at Him and demean Him. His Father could strike them all down immediately; an army of angels could appear and restore the Lord to His true power; instead, Jesus cries out in feelings of abandonment and thirst for a world that would love Him instead of kill Him. After uniting my agonies and pains and shame with Jesus throughout the first four mysteries, I find myself presented with one final, decisive choice. Do I stand alongside the soldiers and delight in the death of Jesus? Or do I hug His mother Mary, then climb onto my own cross alongside the Christ, dying to myself and my selfish ways? I want to choose sorrow and the cross, something made easier for me because I realize that the Sorrowful Mysteries are meditated upon only two days every week. On those five other days, I pray mysteries from the Gospels that are Joyful, Luminous and Glorious. The mission of Jesus Christ didn’t end with the cross.